Happy New year and Best wishes. Has the person who updates this website gone to sleep?…LOL. What happened to the remainder of the Sundays in Advent? That would be me. [g] And no, not gone to sleep (I _wish_…), merely overwhelmed by the holidays. Will put up the rest of Advent–_and_ a small Christmas treat–later. Today, if I can. Happy Birthday! somehow I missed it. You and my Grandmother share the same date, of course she is quite a bit older. She was born in 1915. Best wishes to you for MANY happy returns. Happy Birthday! I hope you’ll have a great year till the next birthday comes. does. Of all the passages in all your books, this is still my favorite. Thanks for posting it on your blog. It’s very unusual for you not to write for that long. I hope you’re okay and on a long and well deserved vacation. Advent. The period of reflection for us Christians. I especially enjoyed chapter 38 with the expression of “Only be”. How trueful and mindful to live in the moment. It is only then that we really begin to understand ourselves. This chapter is worth reading over and over. Congratulations and thanks for the insight. I have recently started reading the Lord John series, in order, and the level of details is so striking! As an avid reader and scholar, I love uncovering all the snip-its that relate or tie in with the Outlander series. It is FUN! Even though I have read the big books twice all the way through, I am still learning new details. On a side note, at first I didn’t want to like the character Lord John, when I read Voyager, but he really grew on me over time, especially in Echo and MOBY. He is a dynamic character, and I am thankful for the books about him too. I really hope I get/make the opportunity to write a dissertation about your fantastic writing. I love your books and the TV adaptation. I have loved every part of the TV series – whether it’s been deletions, additions or just changes. The only thought I have is to wonder why the ‘honesty’ conversation was left out of the wedding episode. I was just wondering if Ron has included it in one of the upcoming shows. It just seems like such a critical conversation to Jamie & Claire’s relationship throughout the rest of the series. Thanks for any insight you might share! Probably not the right spot to post this, but after finishing the TV episodes again and re-reading the first book, I was distressed by two other ‘dropped’ bits Diana wrote that were so GREAT and I wondered why. When Claire leaves Jaime at Wentworth, he doesn’t whisper “He’ll let you go because he thinks you’re helpless, I know you’re not.” Even if it were all in Gaelic per the book, it conveys SO much – pertinent to the scene AND overarching the whole story line. Also when she spies him at the window looking at his wrecked hand, and is afraid she didn’t do enough to make it whole – and instead he expresses his wonder that she saved the hand at all. Both of these, imo, well illustrate why the books are so attractive to women – especially those of us who would like be the capable partner (“not a lass”) to a man like Jaime. That said, cannot wait for the Volume II DVD’s to come out, and for the Dragonfly in Amber episodes!!! I have read all your Outlander books twice I love them. I was so excited to hear that there is to be the series on television. I live in the U.K.of course do you know when it will be here. Great story and I will most likely read them all again. Is there a DVD out for region 2 ? Yours sincerely. Belinda Stubbs. When I read this part of your book it echoed thtough me and I have heard your words many times in my mind. I’m not Catholic. I do understand Claire’s point of view. I was raised Christian. Just Christian. Simple. And I dearly want it to be true. But more and more I believe that it is probably all ‘fiction’. When I read your beautiful words here, I found them to have a good deal of truth in them. And I do believe that a human heart feels what is real and true… maybe in that way good fiction isn’t really ‘fictious’. Thank you, Diana, for your mind, your talent and your heart. Hi Diana, love the story. By the way just watched a little interview of you describing how you write your books. I like that, it gives me hope! Lol I too like to write. Anyways, I find you engaging and delightful. I have not posted here in a very long time. I have been reading the posts on CompuServe on your page regarding the episodes of the TV ADAPTATION. I find that I am going to have to discontinue that habit. It infuriates me to the point of wanting to yell at the screen. I have read all of your books many times; love them all and I love the TV show. I want to say that everyone (of course) is entitled to their opinion and I understand that. But when an opinion is given and someone replies to it disagreeing with it, then you get a LONG retort about why they feel that way when all they are really trying to do is convince you that they are right and you are wrong. When it gets to the point that the posters are ridiculing and insulting your work where they say: well, it should have been done this way, should have been done that way and that was not really necessary, it gets to be a bit much! They also post that this is wrong, that is wrong, etc. etc. etc. and then the last line of the post will state that they cannot wait for the next episode. If I thought the way a lot of these people do, I would simply stop watching. There are only about 10 – 12 posters who continually post over and over and over saying the same things and then they reply to everyone individually saying again the same things over and over. I did stop watching the episodes during the first half of season 1 with the book in hand. The tv show simply adds to the enjoyment of the books, in my opinion. I understand the time constraints of the show. If everything that you wrote wound up in each episode, the season would have to be at least 45 hours long instead of 16. I know you have stated that you have a thick skin but I don’t see how some of this does not get to you in a negative way. Please know that most of your fans love your work, love the show and while maybe not agreeing with everything that is done, can watch it with an open mind and not nitpick every single line of dialogue and enjoy it for what it is – a beautiful adaptation of your story that leaves the essence of the story intact. I hope the series continues for many, many years. This is one fan that will be there watching every time it is on. Hi, Diana! I love the Outlander series and the Starz show! I have read Outlander several times with the idea of finding a clue as to why ghost Jamie was outside Claire’s window and was wondering if when Mrs. Baird is reading Claire’s palm and Claire wanted to ask her about the deep lines at the base of her wrist was a clue? A-line “the wedding /200 years..? Sorry, I meant a-la the wedding and 200 years. Since there WILL be a season 2 covering Dragonfly in Amber, will there be a release of a book with a new cover for the TV show? I surely hope so. Thanks. Read a couple of the books years ago and did not follow through on the rest of the series due to working full time, raising a family, and pursuing a master’s degree. This Spring, for some reason, I picked up book one again and got hooked. I read all the books and the Lord John books in a matter of one month. The scene between Anselm and Clair was meaningful in that it shows her getting in touch with her sense of spirituality for possibly the first time. It was a relief to hear that. She was raised Catholic but had moved on to a more global sense of what spirituality and transcendence is. I do believe people can express these qualities in a wide variety of ways. Diana does a marvelous job expressing them in her writing. Love the books. It was only after reading them that I became aware of the tv series so I spent a few days at the end of April and the beginning of May to see them. 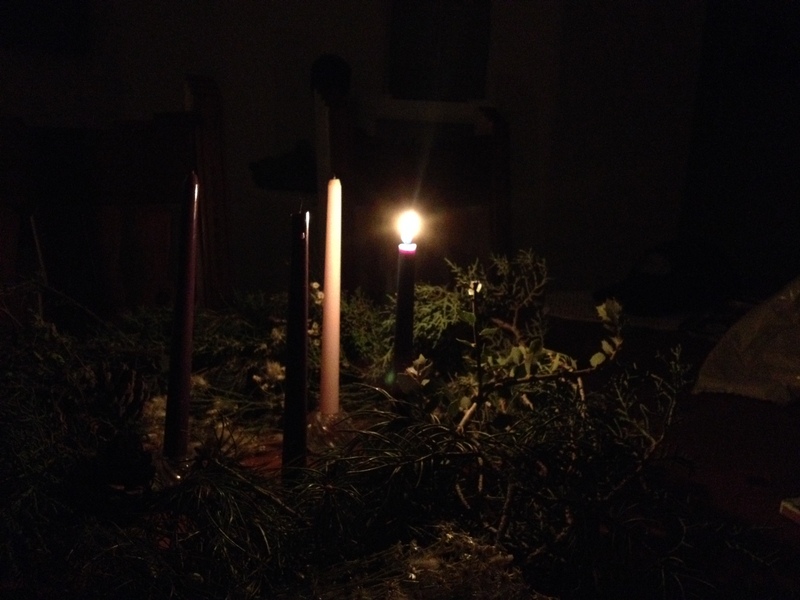 Thank you for the section above on Advent. i just wanted to say that the writing in the first Outlander book on Claires time in the monastery meant a lot to me spiritually. I am Anglican not Catholic , but I read it on a particular weekend where the whole section was incredibly meaningful especially regarding sacraments. Also thank you for keeping that section in the recent TV adaptation. Please, Please try to keep the spiritual aspect of the books in the adaptation as much as possible. It seems that all the TV producers want priests/believers to be the’ bad guys’ and the fashion is to minimize faith-thank you for not doing that. I am a counselor/psychotherapist and I believe people need hope in their lives. I am also a Phd trained Sociologist of Religion and and feel that historically it is fascinating too see different types of faith and the meaning of the Book of Job for example! Anyway- thank you for your writing and your persistence in keeping a spiritual element to Outlander Episode 16!